It is time again dear readers for another old Livonian werewolf legend. The story says that when Christmas day is over a boy who limps with one leg goes around town calling together all of the people who have yielded to the Evil One (and there’s a whole lot of them), bidding them to follow him. If any of these people resist or hesitate, then a huge tall man hits them with a whip braided from iron wire and tiny chains, driving them along with force. The legend says that he whips at the people so roughly that even after a great time has passed the painful marks and scars remain on their bodies. 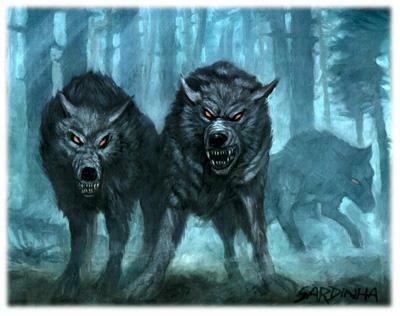 As soon as the group begins to follow the boy, they begin to lose their former shape and transform into wolves. Several thousand wolves come together, walking through the town. The harsh man with the whip leads the way. When they are led into a field, they brutally attack and ravage the cattle, ripping every animal that they can get their fangs on into pieces. But while they are able to kill cattle and livestock, this band of wolves is unable to harm humans. When they eventually come to a body of water, the tall man strikes it using his whip and the water divides, allowing the wolves to cross over with dry paws. After twelve days have passed, they abandon their ferocious werewolf form and become humans once more. I have heard countless werewolf myths, but this one is very new to me. I don’t think I have yet to hear a story even close to this one, I really wish there was more to it. What did you guys think of the legend? What to you think the story means, why were they changed for twelve days? Let us know in a comment below. Are You a Werewolf? Do You want $5,000?